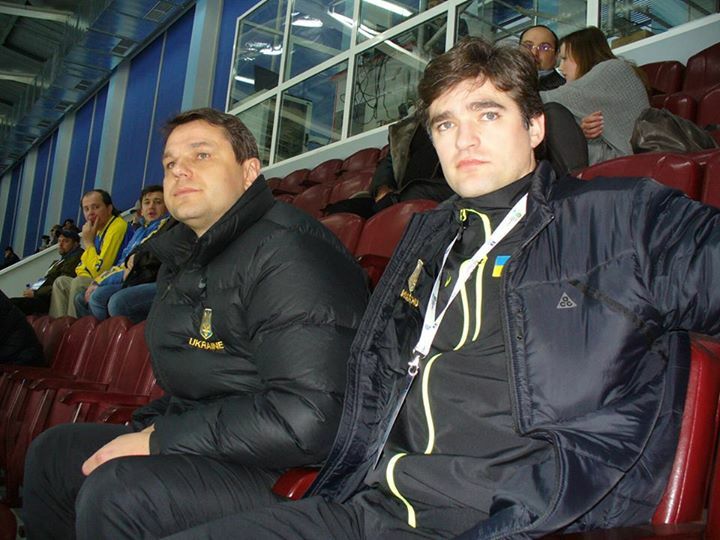 TheHockeyWriters talk to Mykola Oleksandrovich Maiko – the Head Coach of Ukraine’s Junior Team. Mr. Maiko has been coaching junior and men’s teams in Ukraine since 1996 after he was forced to stop his own player career due to health reasons. As a coach he was coaching Ukraine’s national junior U18 and U20 teams as well as professional clubs like Sokil Kyiv and Donbass Donetsk. As a professional player he played 2 seasons as centre forward for Sokil (1994-l996) and 2 seasons for SHVSM Kiev (1992-1994). As a junior player himself Mykola Maiko won gold at the 1994 Junior Ice Hockey World Championships (Pool B) as Team’s Ukraine captain. This result catapulted Ukraine into the top division – Pool A. In 1992 Mykola became Hungarian juniors’ champion with Dunaferr SE (Dunaújváros). THW: Mykola Oleksandrovich, what would you call the golden years of junior hockey in Ukraine? NM: Those definitely were the 1980s back in the USSR times. The facilities and equipment were provided for by the state and big state-owned enterprises, the game was at the peak of its popularity in Kyiv, the country’s capital. Much of this was due to the successes of the country’s flagship club Sokil Kyiv. As grown ups were interested in the game, they supported and nurtured this interest within their children, too. All this resulted in the massive ice-hockey movement, which served as an incredible basis for hockey selection. The clubs then could choose the best from the best and the game was self-sustaining. What is more, back in the 1980s every child could afford playing ice-hockey, as there was no need for parents to buy equipment. Currently, parents have to invest a lot into their children’s hockey development. Another illustration of this hockey fever back then is that hockey rinks for natural ice were built close to every school and almost within every city block. THW: What are the three major challenges that junior hockey faces in Ukraine nowadays? NM: This can be logically deducted from what I have just said: lack of popularity and absence of any organizational structure of the game in the country. No matter how sad it sounds, we could revive the game’s popularity. Just three years ago, when the Professional Hockey League (PHL) was created in Ukraine, people flocked to the arenas. The stadiums were filled in Kyiv, Kharkiv, Brovary, Donetsk. The explanation is simple – people appreciated high-quality hockey. But all this lasted only 1 season long. After the league was effectively closed down foreign players as well as the local ones moved to greener pastures. This year we might have no national ice hockey championships in Ukraine at all. So, the old Soviet system collapsed and we have not created a new one. Such system should be clear-cut and understandable to each participant: be it a club, a professional player, a junior or a parent. Take Canada, for example, there parents have to pay for everything. But once they have paid at the beginning at the season, they are sure that their child will receive everything, which is due: ice time, attention, equipment, instruction and so on and so forth. THW: Can you compare the children’s and youth hockey in Ukraine with that of North America? What experience can the Ukrainians take from their colleagues in Canada and the United States? And vice versa, what can the Canadians and Americans borrow from Ukrainians? NM: At this moment the only thing we can share is enthusiasm of hockey coaches and hockey managers. Plus their inventiveness. It is a big challenge to organize a functioning team in the modern-day Ukraine. And, of course, there is the desire of parents to help their children develop and succeed and their willingness to finance their kids in this process. This parental interest, however, is limited in time. When their children reach the age of fourteen or fifteen parents shift their budgets and thoughts into the academic success of their kids. Everything gets concentrated towards entering a university as ice-hockey in Ukraine offers no professional prospects. So, those kids, who want to succeed in ice-hockey leave Ukraine once they reach their adolescence. They go to Russia, America, Europe. But this is a big step for them, which does not always pay off. There, far away from home and parents, young players can easily neglect both hockey and school. Speaking about learning from North Americans, we need to start from admitting that we do need to learn. By “us” I mean individual Ukrainian coaches and hockey managers as well as the whole hockey community. 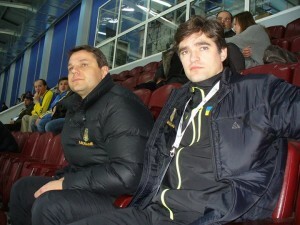 I believe that the Ukrainian Ice Hockey Federation must organize internships of young coaches abroad. Crossing the ocean might be too expensive, but paying for several coaches’ visits to the Czech Republic, Slovakia, Finland or Russia would keep us updated of the tendencies and developments in the world of ice hockey. Of course, internet helps us here, but a young coach needs more than bits and pieces that are available online. They need plunging into environment of great hockey nations and learning intensively through cooperation with the world’s best. Secondly, we need to develop a new clear-cut and transparent system of hockey in Ukraine. And we need to do it from scratch. I remember my first months and years as a young coach. I had the same problem and I felt the catastrophic need to absorb more information about youth hockey. That is when I understood that a player and a coach are two absolutely different professions. I understood full well the words of the great Anatoliy Tarasov, who said that for becoming a coach you first need to kill a player inside yourself. Meaning, you need to totally restructure your way of thinking and acting. Returning to the previous point, such internships and exchange of know-how would result in a great boost for us, even if the visits are not too long. And this is what I wish the young coaches would be able to enjoy and the Ice Hockey Federation would be able to afford sooner or later. By developing our youth hockey we then will be able to help our national team. The problem in Ukraine now is that we are suffering from a generation gap. The older, Soviet-times schooled generation (Zhytnik, Khristich, Fedotenko, to name just a few) has recently finished playing and the new one is not there yet. THW: How would you describe the prospects of young and talented hockey players in Ukraine? NM: Talented and gifted guys play in Ukraine until they turn thirteen. After that 95% of talents move to Russia. There are many players in Russia, but everybody is looking for talents. Take Daniil Sobchenko, for example, who tragically crashed with Lokomotiv Yaroslavl. This talented player (born 1991) moved to Russia when he was eleven. In Yaroslavl he starred playing junior and men’s hockey, was Russia’s U20 and U18 national player and won gold for Russia in 2011. Vladimir Tkachov moved to Russia at the age of thirteen and plays for Ak Bars in Kazan. Born in 1993 he started playing in Kyiv and then moved to Russia. With the Russian national junior team he won bronze at world championships in 2011 and 2013. Talented players in Ukraine and their parents understand that if they continue playing uncompetitive Ukrainian hockey until the age of seventeen, they will not achieve the top level. Thus, we lose future members of our national team, where every player makes a difference. And having three to four young stars can propel Team Ukraine into the world hockey elite. Once team Ukraine plays against Canada, for example, people will be glued to TV-screens and hockey schools will not be able to accommodate everyone. But currently we have low level of competition and high level of expenses. Naturally, children and their parents look for other ways in life. THW: How come that hockey in Ukraine can be incredibly popular in one period of time and then lose almost all of its popularity among sport fans? NM: Popularity of hockey is very similar to popularity of any kind of human activity. The interest of the public starts developing once people see that the game is growing. When the growth process is there, Ukrainian clubs are able to attract good names and strong personalities. Just remember the single PHL season we enjoyed three years ago. We managed to attract many stars, even former NHL-ers and Olympians. I mean Andrey Nikolishin now. Building new clubs would help, too. The PHL years proved it. This single professional season brought many boys into ice-hockey in Kyiv and Donezk, for example. Unluckily, this was only one season. THW: Could you share with THW your secret of motivating adolescents for working hard towards improving their game? NM: I do not think there are any secrets to share. Everything depends on the personality and character. The coach has to support players. I prefer having an open talk and explaining that I am there to help. And I believe that players should appreciate when coaches want to talk to them personally. Through such talks players grow more confident and can better understand what happens to them while they are training and playing in youth teams. There are many players who are able to work independently and motivate themselves. But for many it is a good and valuable piece of advice to know that talent alone never wins. The old rule of 95% perspiration and 5% inspiration still works in ice-hockey. And a coach needs to teach it again and again. Especially to players who in their young years can score ten and more goals in a game, but lose this ability as their competitors and teammates progress. Such guys need coach advice and guidance. And the coach is there to say that talent is just an instrument that needs to be put to proper use. THW: Do hockey schools and hockey clubs recruit girls for playing hockey in Ukraine? What are the prospects of women’s ice-hockey in your country? NM: No, we do not recruit girls. And this is not likely to happen in the near future. There are two reasons for this. Firstly, even boys’ hockey is not a mass sport in Ukraine nowadays. So, we probably will not have one girls’ team for the whole city. And then there is a problem of hockey system and structure in the country. We will go nowhere if we have only one team for girls in the whole country. At least four teams are needed for a start. Again, we have only 5-6 boys’ hockey schools and hockey teams in the whole of Ukraine – barely enough to run a championship. Just compare it with Toronto, where they run several youth championships in one city. Women’s hockey can develop well in the countries with good hockey infrastructure. Meaning that once men’s hockey in Ukraine reaches competitiveness in Europe, we will be able to start developing women’s hockey. Hopefully, we will not miss more than one generation of girls, then. THW: What was motivating you personally when you were sixteen for improving your game? NM: I was born with ice-hockey. I first saw a big hockey game when I was six years old. And then I made my life choice. I understood that hockey is exactly what I want in life. So, motivation was an easy thing for me. I fell in love with ice-hockey at once and forever. And I pass this feeling to my son, who is a young goalkeeper. When I remember myself as a hockey player, I can say that I did not want to be a coach back then. I understood then that it was a hard job. But now I have eighteen years of coaching experience and I am happy to have hockey inside my soul and to be in this game myself. This is a great gift for me to be able to engage myself with the thing I like most. The positive feelings resulting from this compensate for the drawbacks which coaching brings. My wife supports my coaching passion, because she sees me working with strong motivation and doing this hard and not lucrative job. And I am very thankful to her for this support. THW: Let us imagine that your team is playing the final game of an important tournament. The third period begins in a few minutes and the score is balanced. How will you motivate your team for winning the game? NM: Such things did happen in my career, and there were even more difficult situations. What I normally tell guys is that in the last period they need to spare no effort and leave every bit of energy they have on the ice. These simple words motivate and help a lot. They pull the guys’ strings. And no matter how much they are tired, every single player and the whole team are playing with full dedication then. And if my team plays at home I can get into feelings of family attachment, too. So, I would ask my players to play for their parents, their friends in the arena, and their girl-friends, of course. This helps to get out of very difficult situations. P.S. In case the readers of this article feel like helping Ukraine develop its ice-hockey system, infrastructure and talent, you can contact Mr. Maiko and the national federation through the author of this article. In case of the federation, direct contacts are also possible.